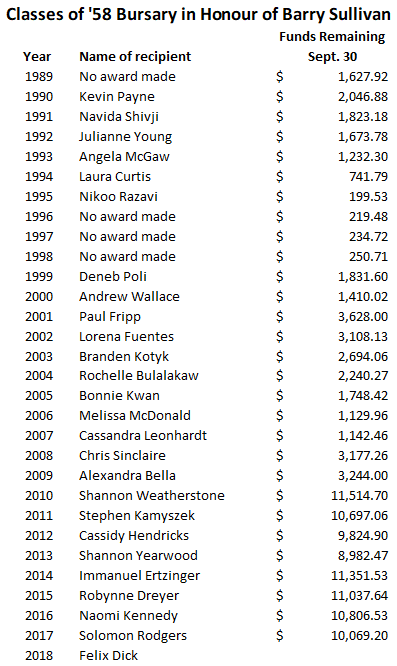 Donations for the Classes of '58 Bursary fund began in December, 1988. The first award was made in 1990 and except for the 1996-1998 period when there were insufficient funds, support has been provided for worthwhile recipients. Any surplus funds from reunion events have been donated to the bursary fund. As shown below, the available funds have increased substantially. It is obvious that some of our members have been very generous. The North Vancouver High School Education Foundation thanks the Classes of '58 for their continuing support. A donation form is provided on this website under Memorial Bursary.